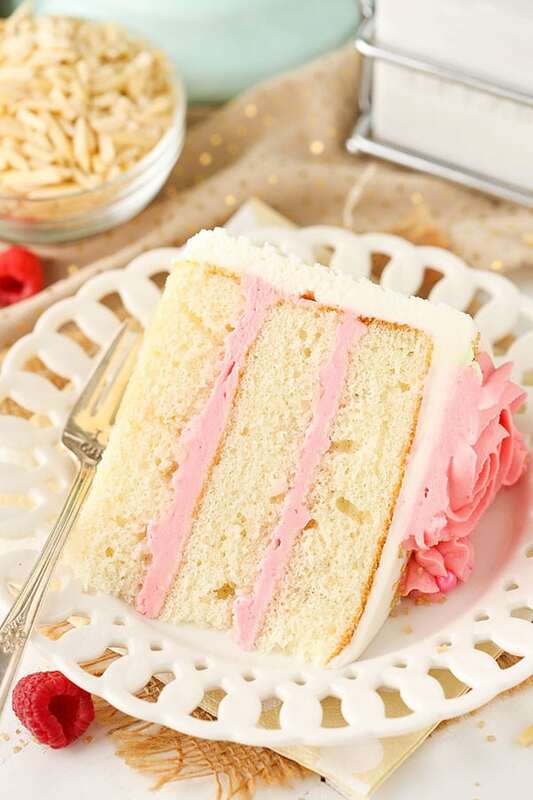 This Raspberry Almond Layer Cake has three layers of moist, fluffy almond cake filled with fresh raspberry frosting! So there was a moment this past weekend where I realized what true love really is. It’s giving your spouse the “best” pillow even when you want it. Let me explain. We were visiting my parents and therefore not using our usual pillows. The first night, we just grabbed the pillow that had been on our side of the bed and went to sleep. Yes, I noticed that his was softer and fluffier than mine, but I wasn’t going to steal it from him. I want him to be comfortable and I can deal with the less fluffy pillow – no problem. “I mean, it’s a little flat, but it’s fine,” I said. “Well mine is too fluffy, it’s hurting my neck. I didn’t want to say anything because I thought you wanted the pillow you have,” he says. Speaking of true love, I’m in LOVE with this cake! I feel like it just looks like a cake you’d make for someone you love too. Those flowers!! I can’t even handle it. The cake starts out with three layers of moist, fluffy almond cake. I feel like almond doesn’t get enough credit for how awesome it is. Vanilla tends to capture hearts, but almond deserves that spot too. It’s one of those flavors that gets me every time I have it. I’ll sometimes forget just how delicious it is and then it reminds me when I bite into it. So good! Once the cakes are made, you’ll make the two frostings. I’ve got raspberry frosting in between the layers and on top as decorations. Then the almond frosting is on the outside of the cake. The raspberry frosting gets its pink color entirely from fresh raspberries. How awesome is that?! To ensure an uninterrupted shade of pink, I puree the raspberries in my food processor and then press the puree through a fine mesh sieve to remove the seeds. 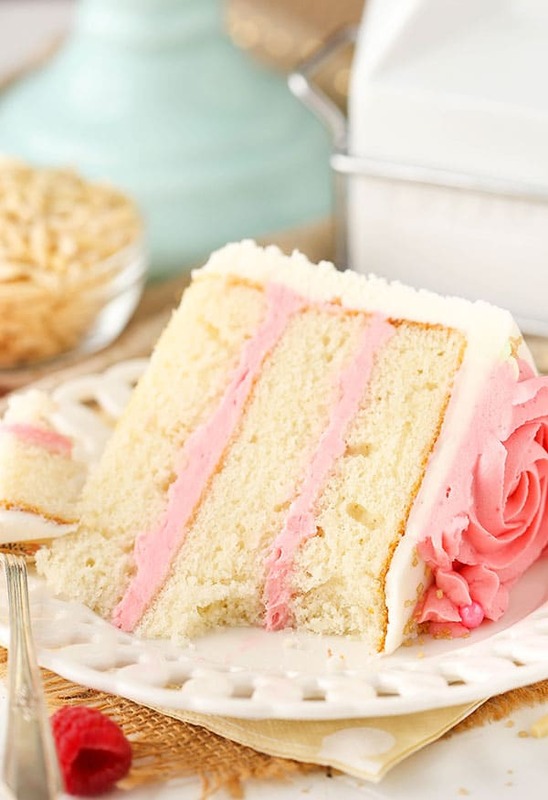 When added to the frosting, it’s a pure, beautiful shade of pink! 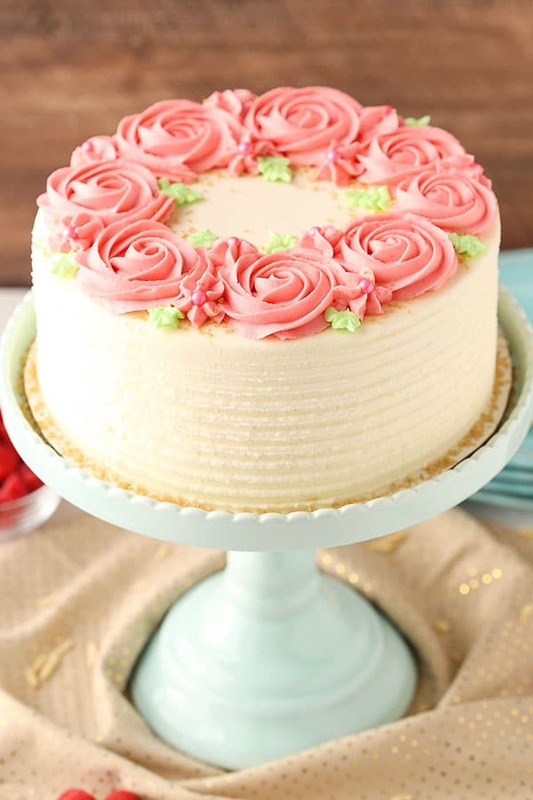 The almond frosting on the outside of the cake is added using the same method as in this tutorial for frosting a smooth cake. I then used the patterned side of my icing smoother to create the pattern in the frosting on the sides. 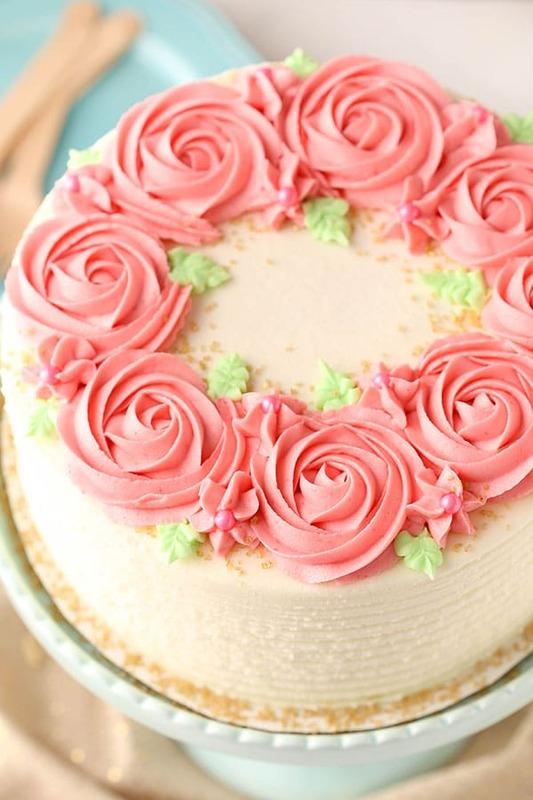 The roses on top are made with a closed star tip – I used the Ateco 844, but the Wilton 1M or 2D would work as well. I colored some of the remaining almond frosting with some green to add a few leaves as well. This cake was a BIG hit! Everyone loved it! Not only is it fun to check out the pretty flowers, but the almond and raspberry together are so light and refreshing! It really is the perfect combo! 1. Prepare three 8 inch cake pans with parchment paper circles in the bottom and grease the sides. Preheat oven to 350°F (176°C) . 2. In a large mixing bowl, cream butter and sugar together until light in color and fluffy, about 3-4 minutes. Do not skimp on the creaming time. 3. Add sour cream and almond extract and mix until well combined. 7. Divide the batter evenly between the cakes pans and bake for about 21-23 minutes, or until a toothpick comes out with a few crumbs. 8. Remove the cakes from the oven and allow to cool for about 2-3 minutes, then remove to cooling racks to cool completely. 9. To make the raspberry frosting, first puree the raspberries in a food processor. Strain the puree through a fine mesh sieve to remove the seeds. 10. In a large mixer bowl, beat the butter and shortening together until smooth. 12. Add 5 tablespoons of raspberry puree and mix until smooth. 13. Slowly add remaining powdered sugar and mix until smooth. Add additional raspberry puree, as needed. Set aside. 9. To make the almond frosting, beat the butter and shortening together until smooth. 12. Add the almond extract and 2 tablespoons of water and mix until smooth. 13. Slowly add remaining powdered sugar and mix until smooth. 14. Add remaining tablespoon of water, if needed. 15. To put the cake together, use a large serrated knife to remove the domes from the top of the cakes so that they’re flat. Place the first cake on a serving plate or a cardboard cake round. 16. Spread about 1 cup of raspberry frosting evenly on top of the cake. 17. Add the second layer of cake and another cup of raspberry frosting. 18. Top the cake with the remaining layer and frost the cake with the almond frosting. Refer to my tutorialfor frosting a smooth cake, if needed. Once frosted, use the patterned side of an icing smoother/comband create the patterned lines on the sides. 19. 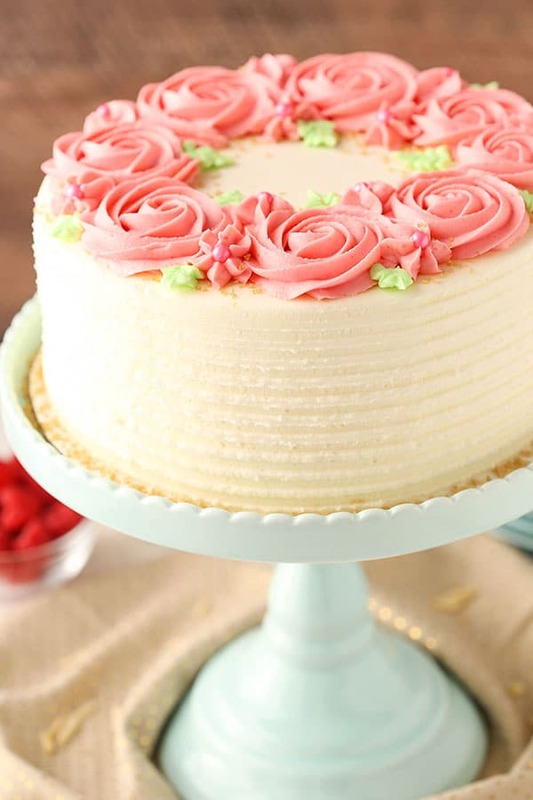 Use the remaining raspberry frosting to pipe rosettes around the edge of the cake. 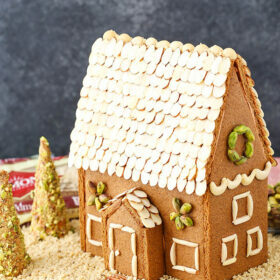 I used Ateco tip 844, but Wilton 1M or 2D would work as well. 20. Color some of the remaining almond frosting green and use it to add some leaves. Sprinkle the cake with some gold sprinkles, if desired. The cake sounds delicious, and I am very happy that it contains almond extract and not almond flour! Almond flour is way too expensive where I live for me to buy, so I usually have to skip over almond recipes. I tend to add almond extract to the most randomest of recipes, so I can’t wait to make this almond-focused cake! Two of my favorite flavors! May have to make this for my birthday cake next month. Hard to decide between cheesecake or this, such a dilemma. Lindsay that cake looks too pretty to eat but having said that I wouldn’t say no to a slice. Do you have a tutorial on making those roses? Thanks Jodie! I do have a tutorial in my new cookbook, but I haven’t put one on the blog yet. How beautiful! Does this cake need to be stored in the fridge? You could probably go either way. I try not to refrigerate cakes if I don’t have to but with the fruit in the frosting, it’s probably good to refrigerate it if it’ll sit out for more than about a day. My husband and I are the same way with pillows! I love the fluffy ones, and he loves the flat ones! 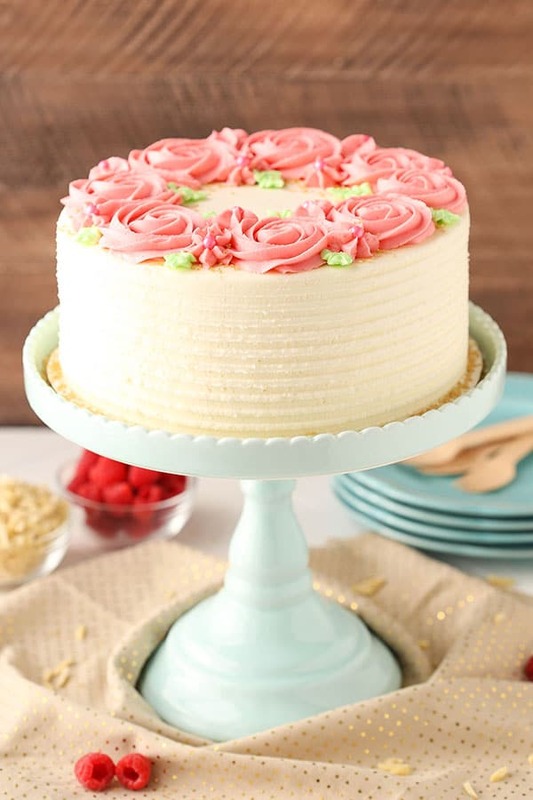 This cake looks absolutely amazing, and I agree–almond flavoring is SO yummy! I love almond extract! It is so yummy! This cake is so pretty! 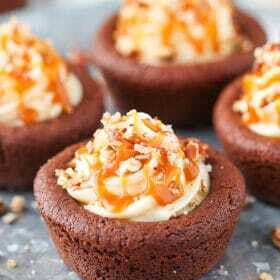 I have been on a hunt for a almond amaretto cupcake recipe. The cake is almond flavor with a amaretto filling. Not sure if it a mousse filling or not? 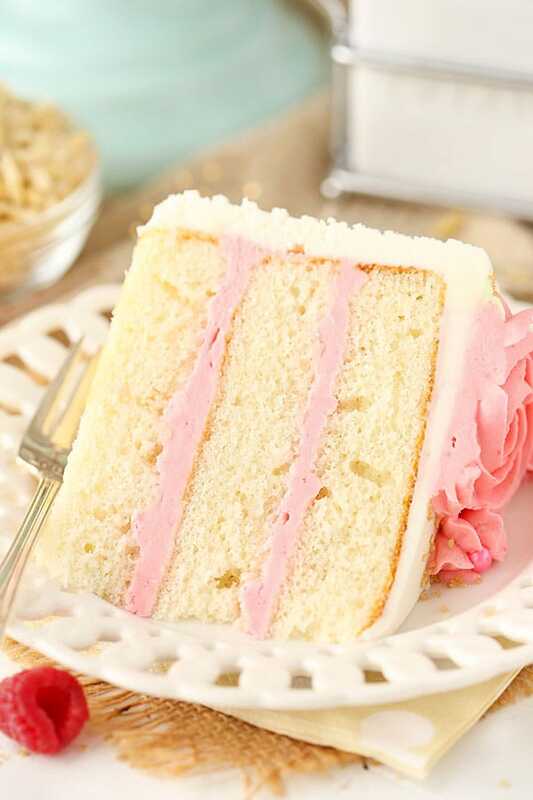 The buttercream is a almond flavored buttercream with slice almonds sprinkled on top! It is AMAZING! Maybe you have some ideas or suggestions on how to recreate this cupcake. It is so yummy and so, so moist! Such a beautiful cake! I love the almond flavor, too! Yum! This cake looks super-duper good. I really want to try this!! Another suggestion is using freeze-dried raspberries for the frosting. Put them in a food processor, turn them into a powder. Shake powder through mesh sieve to remove the seeds. Add powder to frosting until you get the amount of raspberry flavor you want. I like this better than using fresh raspberries because it does not affect the consistency of the frosting. You have outdone yourself, Lindsay! I’m trying it tomorrow for the first time. Do you think I can substitute Greek yogurt for the sour cream? Thanks. I think it’d bake fine, but it does change up the texture and flavor a bit, in my opinion. I just made this cake, but it came out rather dense than fluffy as you described it. 🙁 You have any idea why it could have turned out that way? Would it have been more fluffy if the whole egg was used as opposed to just the egg whites? Are you sure that you fully creamed the butter and sugar? I’ve seen friends make that mistake and it always results in a denser cake. You want to beat the butter and sugar together on medium speed until it becomes lighter in color and fluffy. Note to raspberry lovers like me. Using all the raspberry because, well, more has to be better, MORE RASBERRY……..NOT. My frosting came out too soft. Well, I know I could’ve used more powdered sugar, but I’m disabled. So, making a cake by myself is painful and quite a feat; so, I just used it as is and it ended up looking like a science project, like a volcano. Well, I have to rest, get out of pain, then I will try it and let you know if I succeeded in the flavor category. That’s a great note Amy. It would definitely make a softer frosting. Are you sure the butter and sugar were fully creamed? That’s normally the culprit of a cake that doesn’t rise as well or falls after baking. Lindsey, I forgot to tell you I did not use shortening but used cream cheese instead in the frosting. It came out fabulous. Is this supposed to be very spongy? I creamed he sugar and butter properly, but the batter seemed almost sticky and meringue like before baking. Did I over stir the eggs? Hmm, that sounds strange. I’m not sure what would have happened. My cakes are pretty flat and I beat thr cream and sugar good and proper! Hoping it still tastes delicious! This looks awesome!!! We have a fun night at my school ( I’m 10, and I bake) and there is a cake walk. 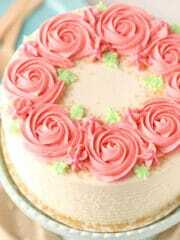 I am making this cake for it!! Made this twice in one week for 2 separate parties! Both times the cake came out perfect. I just thought the almond flavor on the cake was a little too strong so I put less than 1 T the second time I made the cakes. Overall great recipe though! Loved it! I really do wish I knew why that happened for some people, but it’s very difficult for me to know without being there and seeing it or being able to recreate it. I’ve made variations of this cake no less than 100 times and I can’t recreate the issue. I’m sorry. Making these into cupcakes today. Wish me luck lol. My cake fell and was very dense and flat despite following this recipe to a T. Maybe whipping up the egg whites and folding them into the batter instead would work better? Was the butter and sugar fully creamed? That’s normally the issue I see. I made cupcakes with this recipe and they were fantastic. So smooth and tasty. I found a raspberry curd recipe that uses five egg yolks. I am going to try that next for a filling; I think they will pair together nicely and then I will only have one unused egg yolk. Great idea! I’m glad to hear you enjoyed it! Hi! How many cupcakes would this yield? Made this for Mother’s Day. Followed directions exactly and cake was perfect. Rave reviews from family. Batter was super spongy before baking (kind of like angel food cake batter!) but baked up fine. Used 9-inch pans to make slightly bigger cake. Thanks for a great recipe! I’m so glad to hear you enjoyed it! Thanks Karen! Oh, and maybe the cakes are flat for some people because the ingredients are not room temp? I made sure everything sat on my 70-degree counter for a couple hours. My batter was definitely airy and light when I put it into pans. It was not dense like a cake mix would be. Just a thought. 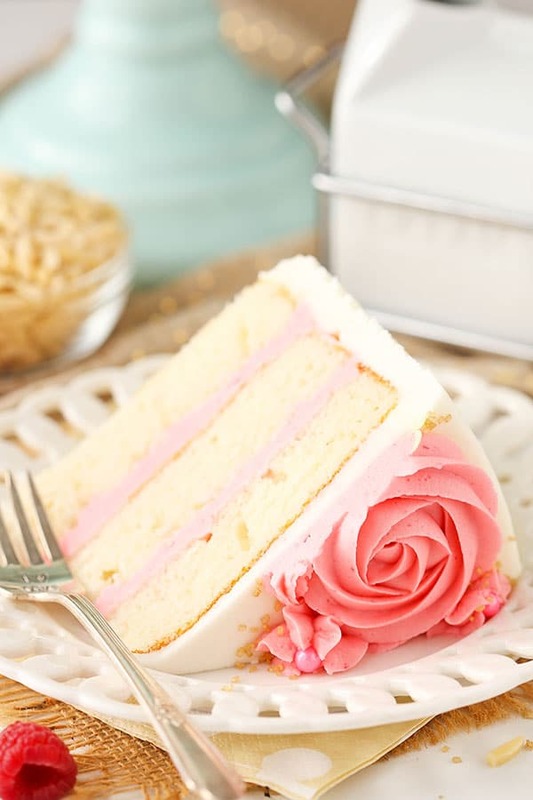 Oh my this cake is so beautiful I want to make it can I use almond flavor instead of almond extract? For those who are coming out with dense cakes, when you fill your pans, do you drop and spin your pans to even out the batter? That takes out some of the air, so I tried just spooning and smoothing the batter and my cakes came out light and moist. My cake turned out flat too. I went back and forth with myself should I make the cake the way it said or beat the egg whites like I think. Well I made the wrong decision. I followed the recipe. My daughter picked this out for her birthday cake I feel horrible.No time to bake another one! It’s not the recipe. The egg whites are not beaten or whipped before adding. That wasn’t the issue. Most likely, the butter and sugar weren’t fully creamed together until lighter in color and fluffy. This happened to me as well (as did to multiple others I see). I think the issue is that there is no baking soda in the recipe. This recipe contains sour cream (an acid) however the carbon dioxide created from the acid and baking soda is not enough to leaven the volume of batter in the recipe. That’s why baking powder should be used as well– to add necessary lift. I will test the cake next week with powder and soda and see what happens. My butter and sugar last time were fully creamed, but still the cake was extremely flat so hopefully the problem will get fixed! You are right about sour cream being an acid and the science there. I can tell you though that I use the base of this recipe all over this site and most people don’t have an issue with rise, so I do think there’s something else going on that’s giving some people a problem. That said, I’d be curious to know if the baking soda helps. I’d try it, but given that I get a different result without it I don’t think my test would provide the same results that you’d get. I hope it works! What kind of shortening did you use? Can you substitute the milk with almond milk? Hi there! I just made this cake and it looks and tastes amazing! The only thing that I don’t understand is that even though it is fully cooked and looks great on the fork, it turns really mushy once you put in your mouth? I thought maybe it was underbaked so I left it in the oven about 5 minutes longer and the toothpick was coming out clean and the cake had moved in from the pan. Any ideas what I could change up next time? Would be pretty in a heart shaped pan too. I ???? almond too! I may try this recipe for My birthday! Yum! This is a top 10 easy to make and great to eat cake. 1 – the almond is too intense with 1 tbsp. I made this 2 times and 1/2 tbsp was a better taste and my kids agreed. 2 – The icing is too sweet. It needs salt I actually used another icing recipe on the 2nd attempt and i added some sour cream to notch that down in sweetness. I will be making this again and I will use Italian buttercream to see if that is even better. Beyond those things noted above, this cake was marvelous in prep time, it baked well, had a great crumb, handled cutting well, great texture, was sufficiently moist. I am going to use this as a base for other variations (vanilla bean, lemon….). Made this cake for my daughter’s birthday, it looks beautiful and baked up perfectly. It definitely was way too strong of an almond flavour for me, but that’s personal taste. I also put in way less sugar in my buttercream, but again, that’s personal taste. The instructions for assembly were so helpful. My son told me I should get the world record for most beautiful cake ever made! So glad it turned out well! I prefer not to use shortening. Would I use the same amount of butter to substitute? And should i use salted or unsalted? Yes, the same amount of butter. As for salted/unsalted there are a couple options. You don’t want to use all salted because that would be too much salt. You could use half salted/half unsalted, or just go with all unsalted and add your own salt. I’d start with 1/2 teaspoon and add a little more to your taste, if needed. Hola linsey te quedó hermoso el pastel, no puedo quedarme sin hacer esta receta, por favor sube el vídeo de la preparación, muchas gracias por compartirlo, saludos desde Guanajuato México. Soy tu fan????‍???????????? I am interested in making this cake for a party Saturday evening but can only bake on Thursday. Can I still use this recipe? I would be concerned that it would have to sit in the fridge with the use of raspberries then dry out. Yes, you could still use this recipe. I try not to refrigerate cakes if I don’t have to but with the fruit in the frosting, it’s probably good to refrigerate it if it’ll sit out for more than about a day. I would give this cake 3 stars. It is definitely on the very sweet side. My husband likes very sweet cakes with lots of sugar and he really liked it, but I am European and I prefer less sweet cakes. Would probably not make it again with this amount of sugar, maybe half. WHERE did you get that gorgeous blue cake stand? I made this cake for the middle tier of my brother’s wedding cake last weekend. I used your chocolate cake recipe for the top and bottom tiers and used the raspberry buttercream for those as well. I just made your vanilla buttercream for the whole outside of the cake. It was a huge success. The whole cake got eaten. I loved the almond cake! But I always love your recipes and go to your website first whenever I need to bake anything! You are gifted! Thanks for sharing your gift!